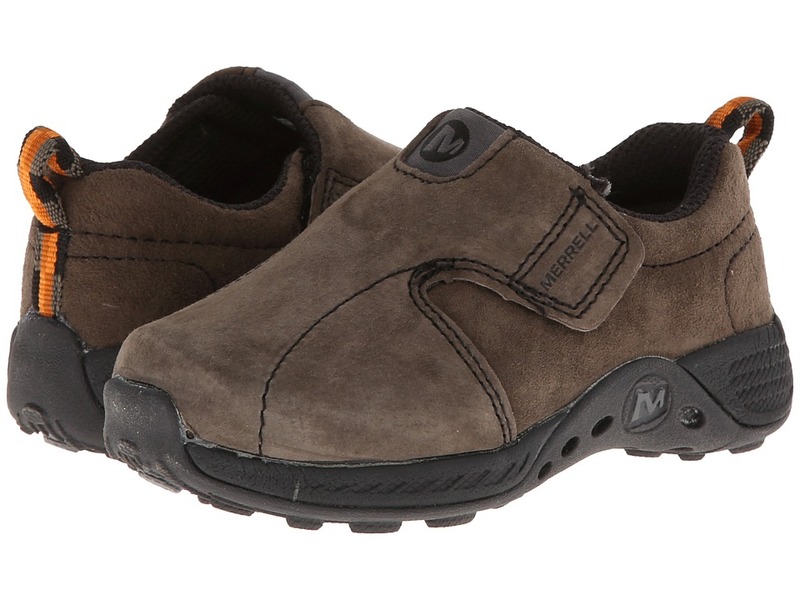 Add a blast of casual style to your look with the Encore Gust from Merrell&amp#174. Full-grain leather upper with padded collar. Polyester mesh lining with Aegis&amp#174 antimicrobial treatment provides protection and breathability. Ortholite&amp#174 anatomical footbed offers cushioning, support and all-day comfort. Nylon arch shank and Air Cushion midsole add stability and absorb step shock. 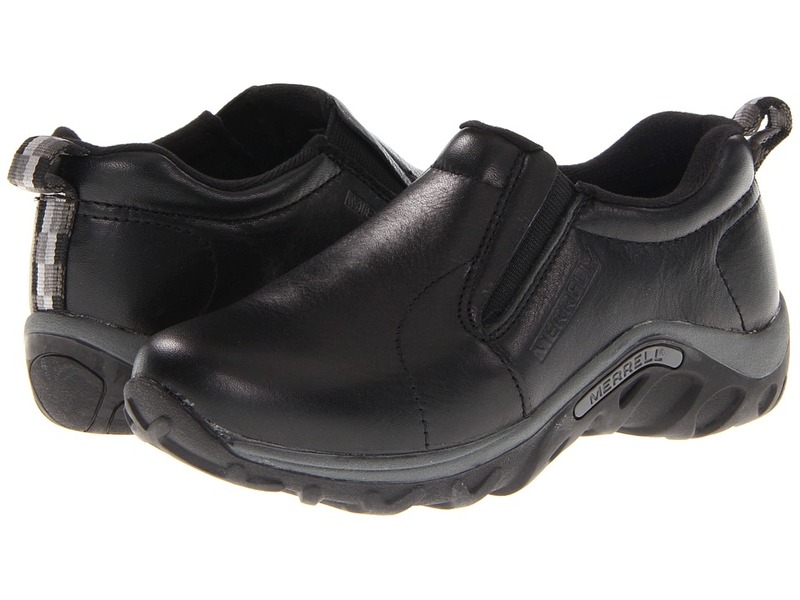 Encore&amp#8482 sticky rubber outsole delivers flexibility and reduces foot and leg fatigue. Measurements: Weight: 10 oz Product measurements were taken using size 8.5, width M. Please note that measurements may vary by size. Weight of footwear is based on a single item, not a pair. Who needs motor transportation, with the Encore Bypass clog from Merrell you~ll want to walk everywhere! Full grain leather and mesh upper with strobel construction offers all-over flexibility and comfort. 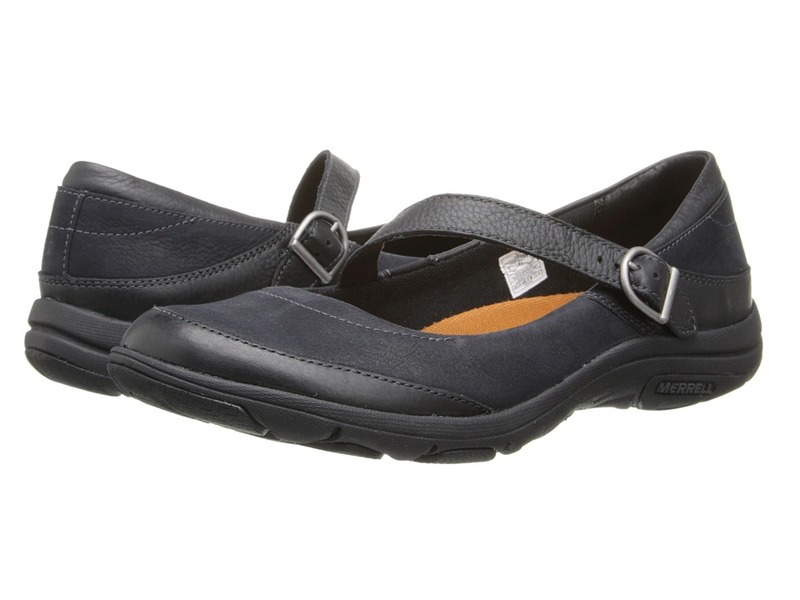 Convenient slip-on style with padded collar provides an easy, comfortable fit for all-day wear. Breathable mesh lining treated with Aegis antimicrobial solution resists odor to keep your feet feeling fresh. 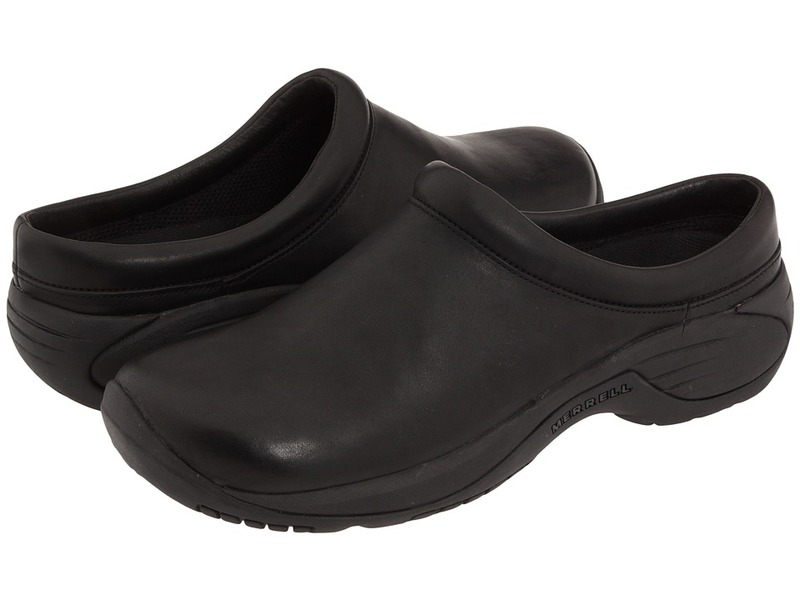 Ortholite anatomical footbed with molded nylon arch shank delivers support. Compression molded EVA footframe with air cushion in the heel that absorbs shock for stability and comfort. 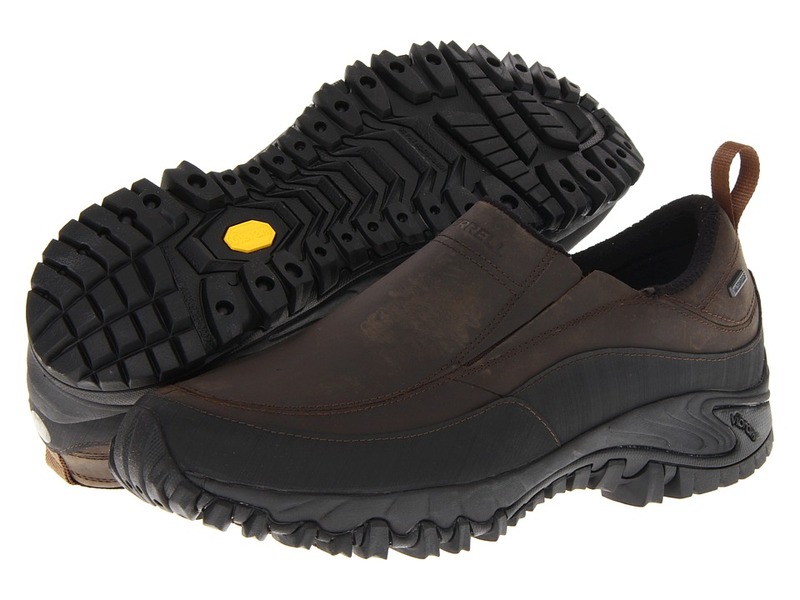 Sticky rubber outsole offers durable grip and flexibility to keep you walking in style. Measurements: Weight: 11 oz Product measurements were taken using size 10.5, width M. Please note that measurements may vary by size. Weight of footwear is based on a single item, not a pair. You~ve got the chill beat with the Jungle Moc Frosty! 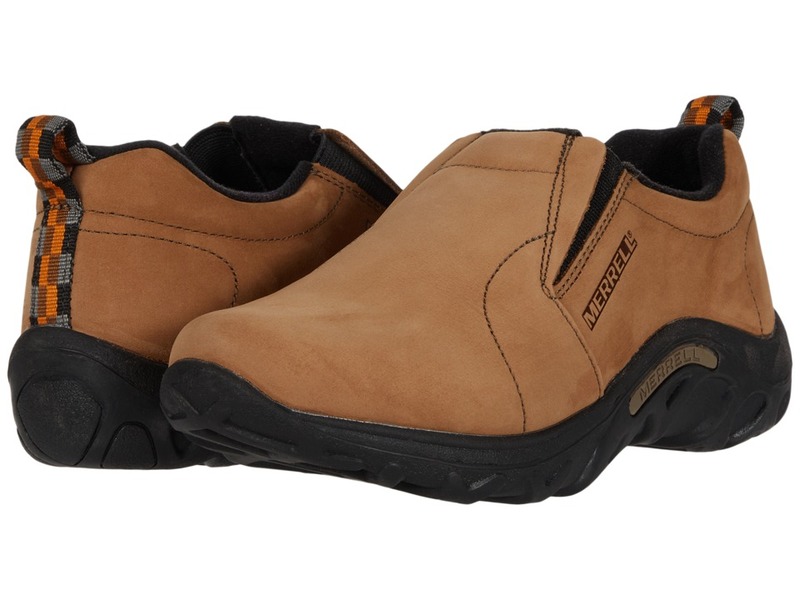 Waterproof suede upper with Strobel construction for increased flexibility and comfort. Waterproof membrane offers protective, impermeable barrier while still maintaining breathability. Slip-on style with pull tab at heel and side goring for easy on and off. 200g Merrell Opti-Warm&amp#8482 insulation keeps toes toasty. Removable EVA footbed treated with Aegis&amp#174 antimicrobial solution so that feet stay fresh. Molded nylon arch shank adds support at midfoot. Merrell air cushion in the heel absorbs shock. Non-marking rubber outsole for maximum traction. Measurements: Weight: 9 oz Product measurements were taken using size 1.5 Little Kid, width M. Please note that measurements may vary by size. Weight of footwear is based on a single item, not a pair. You~ve got the chill beat with the Jungle Moc Frosty! 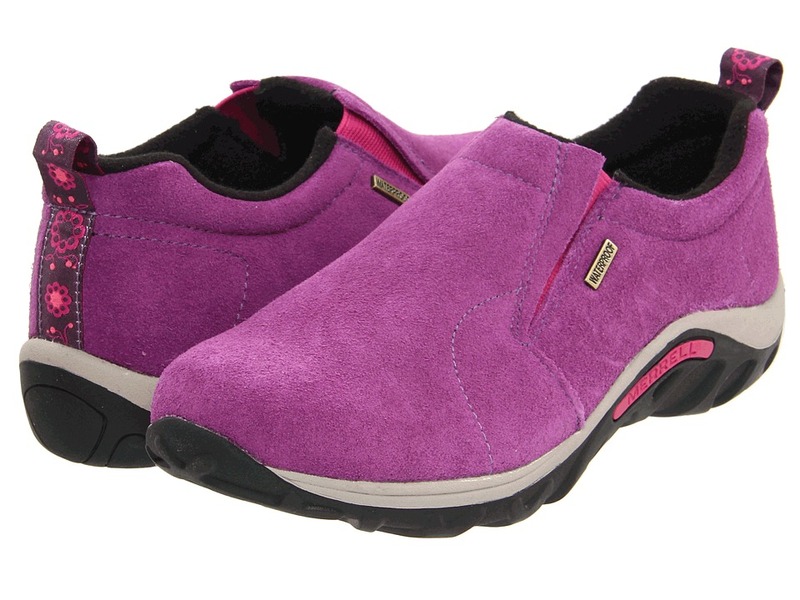 Waterproof suede upper with Strobel construction for increased flexibility and comfort. Waterproof membrane offers protective, impermeable barrier while still maintaining breathability. Slip-on style with pull tab at heel and side goring for easy on and off. 200g Merrell Opti-Warm&amp#8482 insulation keeps toes toasty. Removable EVA footbed treated with Aegis&amp#174 antimicrobial solution so that feet stay fresh. Molded nylon arch shank adds support at midfoot. Merrell air cushion in the heel absorbs shock. Non-marking rubber outsole for maximum traction. Measurements: Heel Height: 1 in Weight: 12 oz Product measurements were taken using size 5.5 Big Kid, width M. Please note that measurements may vary by size. Weight of footwear is based on a single item, not a pair. It~s a Jungle out there! Full grain leather upper. Lined with nylex for excellent comfort. Removable EVA footbed. Air cushioned EVA midsole for extra support. Non-marking rubber outsole with a unique traction design. Measurements: Weight: 9 oz Product measurements were taken using size 2 Little Kid, width M. Please note that measurements may vary by size. Weight of footwear is based on a single item, not a pair. Jump for joy in the Jungle Moc! Nubuck leather upper. Lined with nylex for excellent comfort. Removable EVA footbed. Air cushioned EVA midsole for extra support. Non-marking rubber outsole with a unique traction design. Measurements: Weight: 9 oz Product measurements were taken using size 2 Little Kid, width M. Please note that measurements may vary by size. Weight of footwear is based on a single item, not a pair. 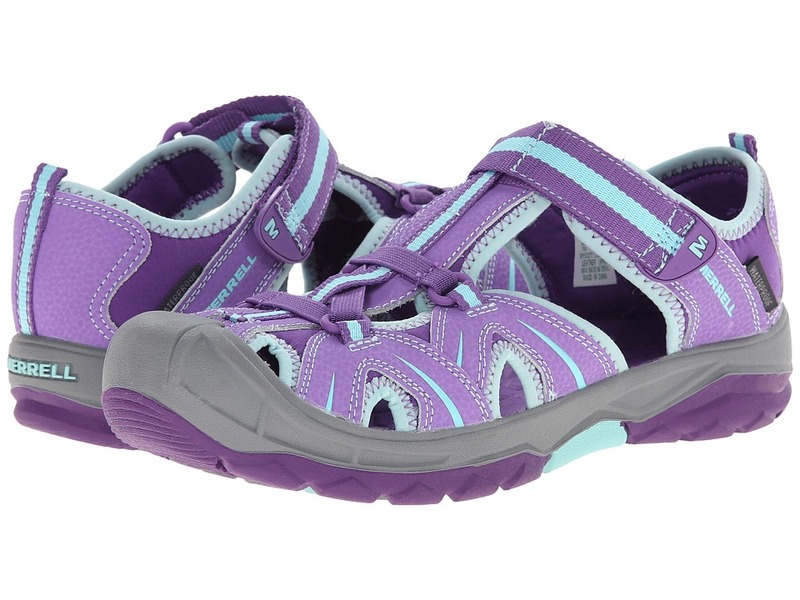 The jungle gym just got a little more fun with the Merrell Kids Jungle Moc! Suede upper with Strobel construction offers flexibility. Slip-on style with pull loop for easy on and off. Removable EVA footbed and Nylex&amp#8482 lining treated with Aegis&amp#174 antimicrobial solution to keep feet fresh. Molded nylon arch shank provides additional support where it counts. Merrell&amp#8482 air cushion in the heel absorbs shock and adds stability. 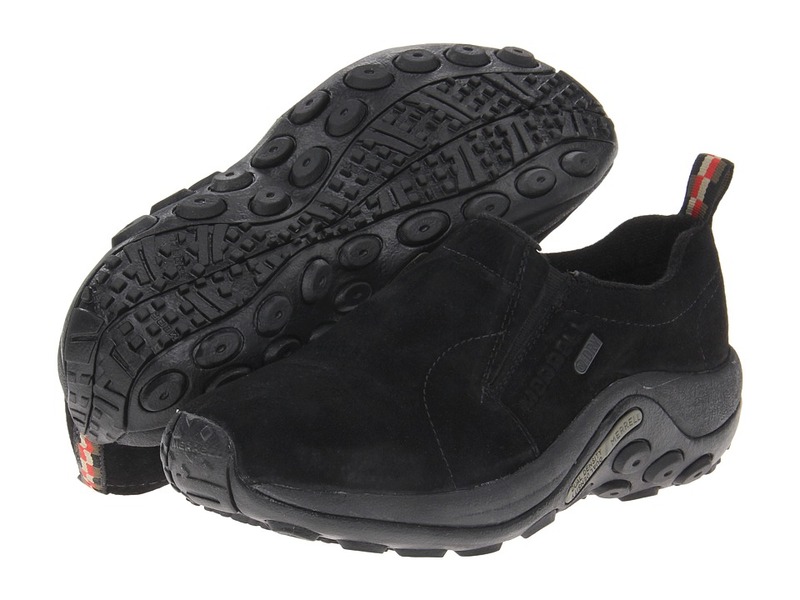 Non-marking rubber outsole gives maximum traction on a variety of surfaces. Measurements: Weight: 10 oz Product measurements were taken using size 2 Little Kid, width M. Please note that measurements may vary by size. Weight of footwear is based on a single item, not a pair. 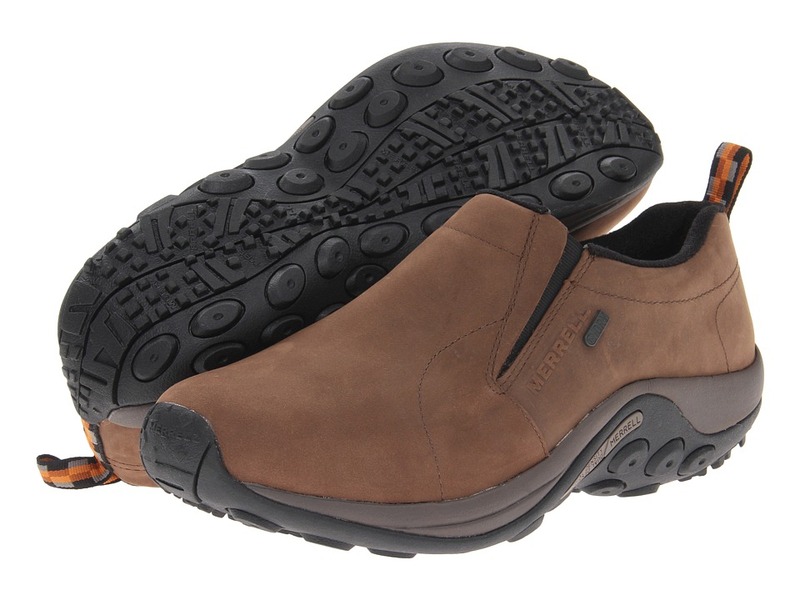 This slip-on moc from Merrell will keep you from shivering even when the temperature plummets. Full-grain leather upper features an elastic stretch band for easy on and off. Waterproof Membrane provides impermeable but breathable barrier. Polartec lining with Aegis antimicrobial treatment keeps feet clean and warm. EVA footframe and air cushion midsole supplies support and shock absorption. Vibram thermo multisport rubbers outsole helps maintain a solid and steady stride. Measurements: Heel Height: 1 1 2 in Weight: 14 oz Platform Height: 1 in Product measurements were taken using size 12, width M. Please note that measurements may vary by size. Weight of footwear is based on a single item, not a pair. 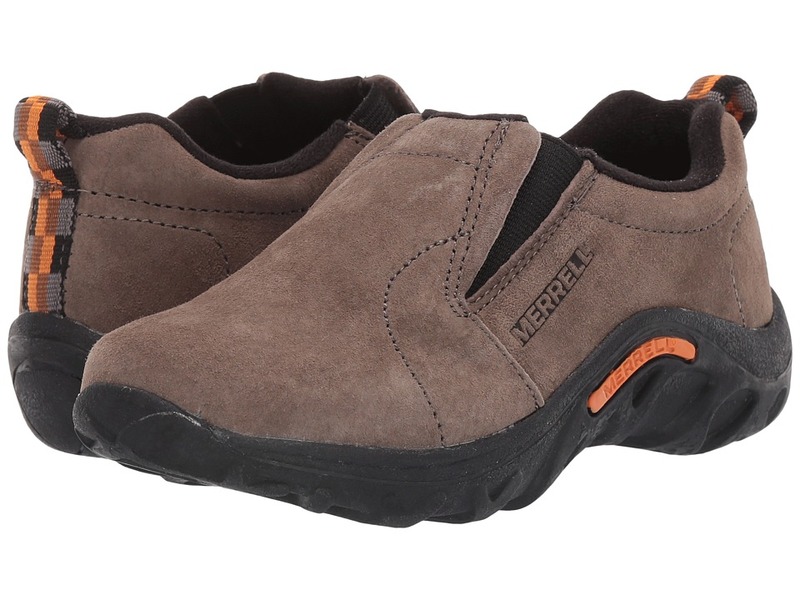 Trek through any nature with the Jungle Moc Nubuck Waterproof hiking shoe from Merrell. 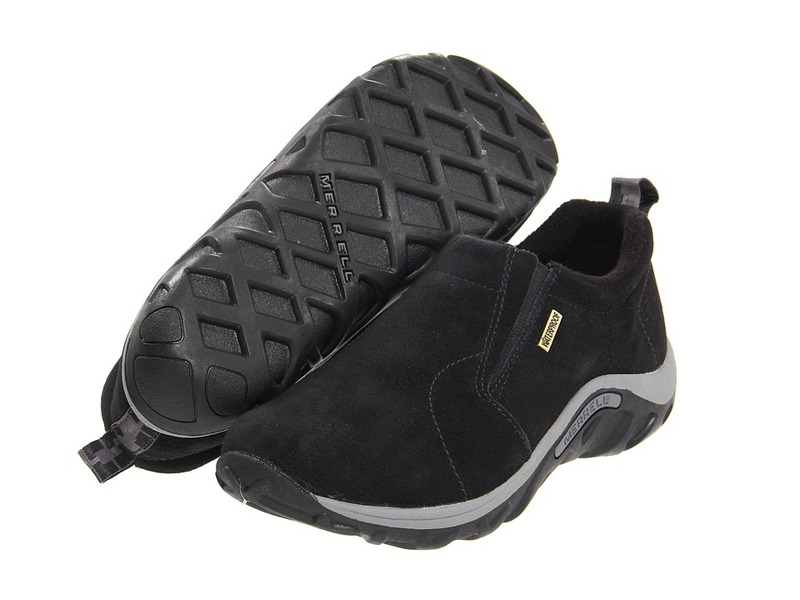 Waterproof nubuck uppers with dual goring sides for easy slip on. Pull tab on back for easy on and off. M-Select FRESH naturally prevents odor before it starts for fresh smelling feet. Molded nylon arch shank. Compression molded EVA footframe with air cushion in the heel absorbs shock and adds stability. M-Select GRIP tunes each outsole with durable traction that grips when and where you need it. Imported. Measurements: Heel Height: 1 1 2 in Weight: 1 lb 1 oz Platform Height: 1 in Product measurements were taken using size 11.5, width W. Please note that measurements may vary by size. Weight of footwear is based on a single item, not a pair. Through casual adventures and treks through puddles the Jungle Moc Waterproof shoe from Merrell will keep you dry and ready! Waterproof suede leather uppers. Pull tab for easy on and off. M-Select FRESH naturally prevents odor before it starts for fresh smelling feet. Molded nylon arch shank. Compression molded EVA footframe with air cushion in the heel absorbs shock and adds stability. M-Select GRIP tunes each outsole with durable traction that grips when and where you need it. Imported. Measurements: Weight: 15 oz Product measurements were taken using size 11, width M. Please note that measurements may vary by size. Weight of footwear is based on a single item, not a pair. 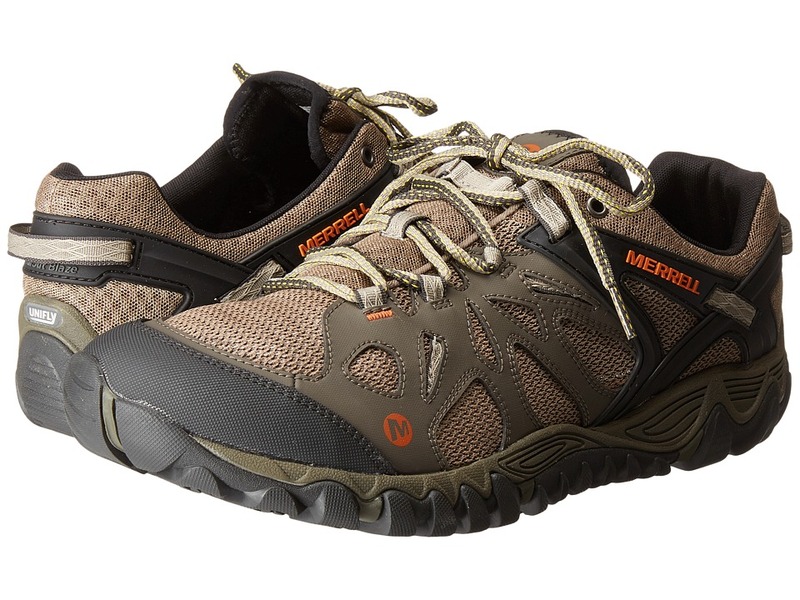 Trek through any nature with the Jungle Moc Waterproof hiking shoe from Merrell. Waterproof pigskin with dual goring sides for easy slip on. Pull tab on back for easy on and off. M-Select FRESH naturally prevents odor before it starts for fresh smelling feet. Molded nylon arch shank. Compression molded EVA footframe with air cushion in the heel absorbs shock and adds stability. M-Select GRIP tunes each outsole with durable traction that grips when and where you need it. Imported. Measurements: Heel Height: 1 1 4 in Weight: 12 oz Platform Height: 1 in Product measurements were taken using size 8.5, width M. Please note that measurements may vary by size. Weight of footwear is based on a single item, not a pair. 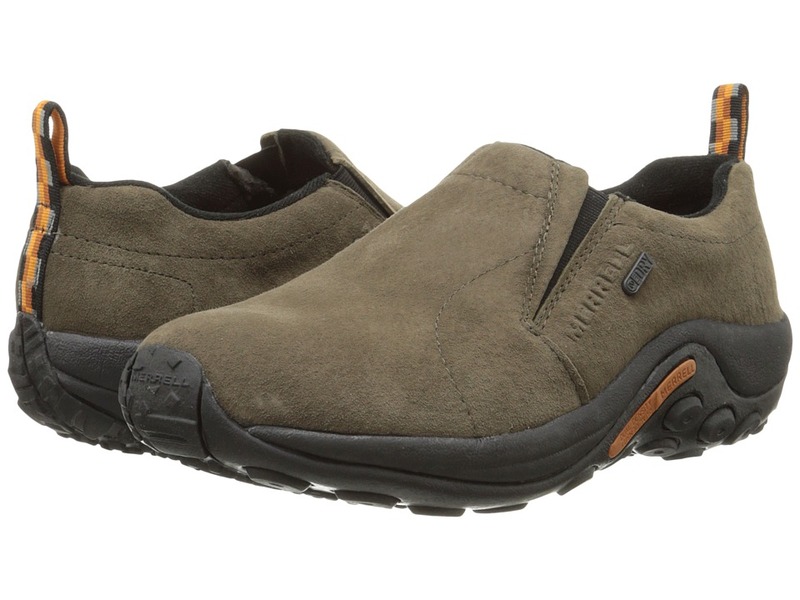 The Jungle Moc slip-on from Merrell is ideal for outdoor enthusiasts seeking an easy-on, supportive and comfortable shoe. Water-resistant leather upper with dual instep goring for a secure yet flexible fit. Double hook-and-loop system for easy on and off. M-Select FRESH prevents odor. EVA footbed adds comfort without adding weight. Merrell Air Cushion midsole with Jungle Runner sticky rubber outsole. Imported. Measurements: Weight: 4 oz Product measurements were taken using size 8 Toddler, width M. Please note that measurements may vary by size. Weight of footwear is based on a single item, not a pair. 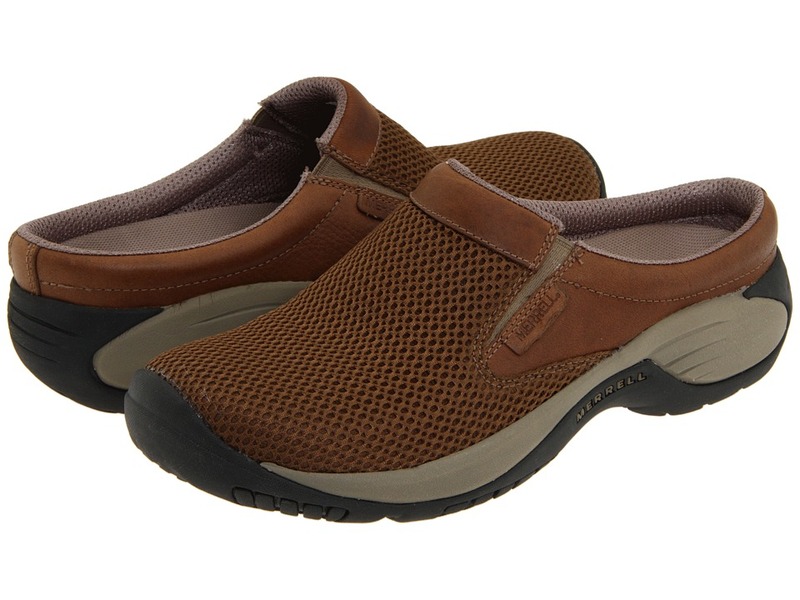 You are sure to fall for the Merrell Land-Sandal-inspired design and sophisticated air of the Dessi MJ. Full grain and nubuck leather upper materials. Adjustable mary jane strap with buckle closure. Breathable mesh lining features M SELECT FRESH technology to help stop odors. Contoured, molded EVA footbed offers light underfoot plush. Merrell air cushion in the heel helps absorb impacting shock. Molded nylon arch shank. M Select GRIP outsole supplies lasting traction and grip. Imported. Measurements: Heel Height: 3 4 in Weight: 7 oz Platform Height: 1 2 in Product measurements were taken using size 9, width M. Please note that measurements may vary by size. Weight of footwear is based on a single item, not a pair. 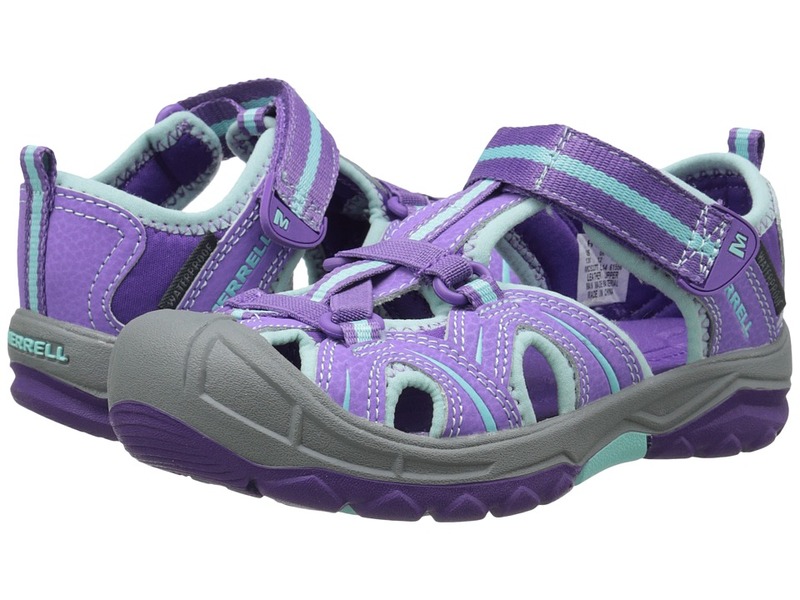 Their first, or tenth, hike will feel comfortable as they trample the trails in the Hydro hiker from Merrell Kids! Durable leather uppers. Vented upper for breathability. Hook-and-loop closure for easy on and off. Heel pull-loop for easy entry. High collar for all-day support. Quick-dry, hydrophobic lining is treated with M-Select FRESH odor control. EVA integrated footbed for added comfort. M-Select GRIP tunes each outsole with durable traction that responds to wet and sloppy conditions. Imported. Measurements: Heel Height: 1 1 4 in Weight: 8 oz Product measurements were taken using size 13 Little Kid, width M. Please note that measurements may vary by size. Weight of footwear is based on a single item, not a pair. 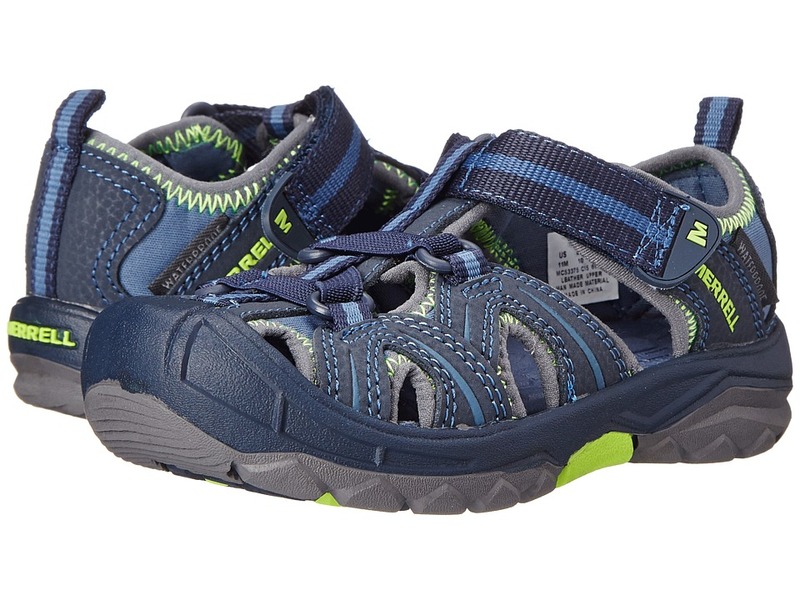 Their first, or tenth, hike will feel comfortable as they trample the trails in the Hydro hiker from Merrell Kids! Lightweight synthetic leather upper. Vented upper for breathability. Hook-and-loop closure for easy on and off. Heel pull-loop for easy entry. High collar for all-day support. Quick-dry, hydrophobic lining is treated with M-Select FRESH odor control. EVA integrated footbed for added comfort. M-Select GRIP tunes each outsole with durable traction that responds to wet and sloppy conditions. Imported. Weight of footwear is based on a single item, not a pair. 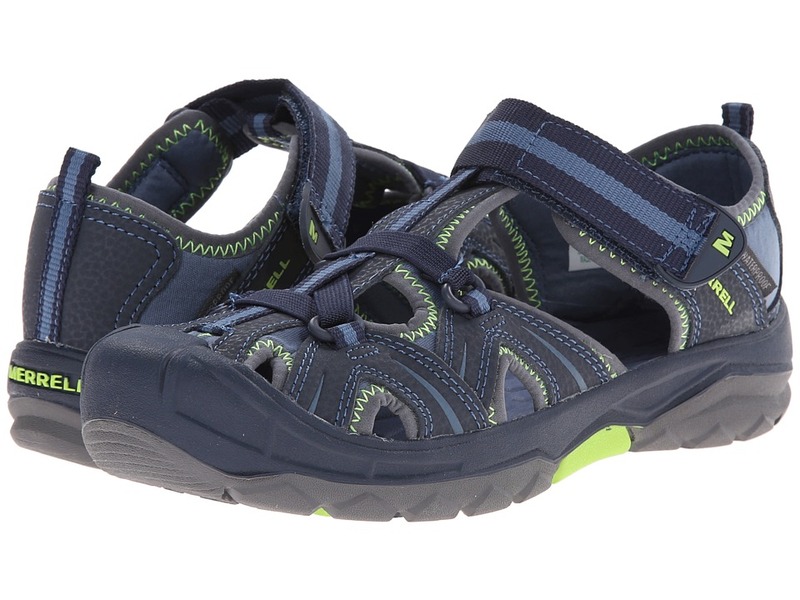 Their first, or tenth, hike will feel comfortable as they trample the trails in the Hydro hiker from Merrell Kids! Lightweight synthetic upper. Vented upper for breathability. Hook-and-loop closure for easy on and off. Heel pull-loop for easy entry. High collar for all-day support. Quick-dry, hydrophobic lining is treated with M-Select FRESH odor control. EVA integrated footbed for added comfort. M-Select GRIP tunes each outsole with durable traction that responds to wet and sloppy conditions. Imported. Measurements: Heel Height: 1 in Weight: 7 oz Product measurements were taken using size 13 Little Kid, width M. Please note that measurements may vary by size. Weight of footwear is based on a single item, not a pair. Fly lightly over the trail and be the first to crest the ridge in speedy performance and design of the Merrell All Out Blaze Aero Sport hiker. Lightweight, breathable mesh upper with supportive synthetic overlays. Bellows tongue helps keep debris out. Merrell Omni-Fit lacing system promotes a precise, glove-like fit. Molded TPU heel counter provides added stability. Heel pull loop for an easier on and off. Lightly padded collar. Breathable mesh lining is treated with odor-fighting M Select FRESH technology to keep feet feeling fresher longer. Foam footbed offers light underfoot comfort. UniFly midsole delivers lightweight underfoot protection. 5 mm lug depth. Vibram outsole. Imported. Measurements: Weight: 13 oz Product measurements were taken using size 11, width M. Please note that measurements may vary by size. Weight of footwear is based on a single item, not a pair.